“Unheard.” Erich Itor KAHN: Fragment eines unvollendeten Streichquartetts (1924). Hans Walter SÜSSKIND: Rechenschaft über uns (1933)*; Vier Lieder (1928)**. Josef Matthias HAUER: Fünf Stücke für Quartett, Op. 30 (1924). Otto JOKL: Zweites Streichquartett, Op. 28 (1948). Louis GRUENBERG: Vier Indiskretionen für String Quartet, Op. 20 (1925). Barbara Kozelj* (sop), Daniel Reuss** (speaker), Ebony Quartet: Marleen Asberg, Anna de Vey Mestdagh (vln), Roland Krämer (vla), Daniel Esser (vlc). Channel Classics CCS 40517 (1 CD) (http://www.channelclassics.com/). These are premiere recordings of works which fell through the 20th century’s cracks. The Ebony Quartet are members of the Royal Concertgebouw Orchestra who also step out as the string players of the Ebony Band. Kahn (1905-1956) just barely kept one step ahead of the Nazis, fleeing to Paris and eventually to the US where he coached Benny Goodman and accompanied Feuermann and Francescatti. 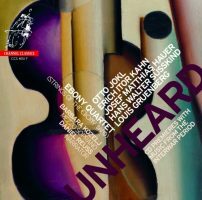 This ten-minute fragment sounds like Grieg was dropped into 1920s Germany: Unexpected Expressionistic twinges color rambling and recurring tonal material. Hans Walter Süsskind (1913-1980) may be more familiar as the conductor Walter Susskind, who commanded the Saint Louis Symphony for several years. Süsskind’s setting of Louis Fürnberg’s Rechenschaft über uns (“Accountability for us”) is period agitprop for speaker and quartet. The four songs, for soprano and quartet, demonstrate a Webernian terseness. Schoenberg’s 12-tone system has prevailed, despite Hauer’s insistence that he was its true inventor. However, the method that Hauer (1883-1959) employed differed drastically from Schoenberg’s more equitable use of tones: Hauer would arrange his notes and stick with that order for a whole movement, permitting tonal harmony if the pitches so aligned. These are short, quirky Stücke, their guiding structure not readily apparent. Jokl (1891-1963) came to the US in 1940. He eventually worked for Associated Music Publishers, and had a hand in an edition of Mahler’s Tenth (Krenek’s version of the Adagio and Purgatorio). Jokl’s Second string quartet is this recital’s biggest surprise. Intense, atonal, or perhaps serial, with catchy rhythms, harmonies and motives, it is like discovering the original music that American academics would desperately try to write many decades later. The work first appeared under a pseudonym, Anthony Garden. Philip GLASS: Saxophone Quartet (1995; arr. Brooklyn Rider)1; String Quartet No. 6 (2013)2; String Quartet No. 7 (2014)3. Brooklyn Rider: Johnny Gandelsman1,2,3, Colin Jacobsen2,3 (vln), Colin Jacobsen1, Nicholas Cords1,2,3 (vla), Michael Nicolas1,2,3 (vlc). Orange Mountain Music OMM 0121 (1 CD) (http://www.orangemountainmusic.com/). 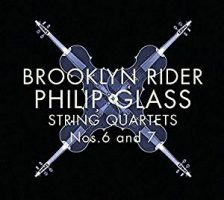 The Sixth string quartet is denser than the Brooklyn Rider’s arrangement of Glass’ Saxophone Quartet, even as the quartet doubles the viola, instead of the customary violin. Most likely Glass compensates for the saxophones’ need to breathe, whereas strings may saw continuously and play chords. There is no doubting the Saxophone Quartet’s composer, however the nearly 20-years-later No. 6 fidgets, fluctuating its discourse and lapping combinations among the two-against-three and brightening arpeggios. It may scandalize to say so, but in the central movement I hear ululations recalling Brahms’ G Major Sextet. Each movement wanders away, leaving a strong sense of unfinished business. Late Glass is getting interesting. Back when, the Brooklynites’ ensemble (Orange Mountain Music OMM 0074) sounded unfinished, qualities still evident in No. 6’s speedier parts, especially in legato passages. As No. 7 is slower, more of an ensemble panorama, the Riders are just fine. No. 7 is a departure: darkly hued, predominantly slower, with less of the expected minimalist seesawing. It originally accompanied the Nederlands Dans Theatre’s performance of “Spiritwalking,” and is cast in a single movement that detours without arriving. “Liquid Days” have folded into opaque twilight. The constant appearance of new material suggests the impenetrable design of Debussy’s Jeux. 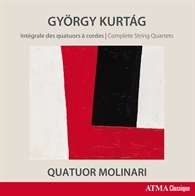 “Complete String Quartets.” György KURTÁG: Quatuor à cordes, Op. 1 (1959); Hommage à András Mihály, Op. 13 (1977-78); Officium breve in memoriam Andræ Szervánsky, Op. 28 (1988-89); Aus der Ferne III (1991); Aus der Ferne V (1999); Hommage à Jacob Obrecht (2004-05); Six moments musicaux, Op. 44 (1999-2005); Arioso (2009). Quatuor Molinari: Olga Ranzenhofer, Frédéric Bednarz (vln), Frédéric Lambert (vla), Pierre-Alain Bouvrette (vlc). Atma ACD2 2705 (1 CD) (http://www.atmaclassique.com/). As much as I admire Kurtág’s music, after serious contemplation of ECM’s recent three-fer, I am more sensitized to the Hungarian-born composer’s particular angst. After conquering Schnittke and Gubaidulina, the Molinari adeptly confront Kurtág. Easy to imagine these are shards, except these are those pieces of glass arranged at the tops of concrete walls to prevent birds from landing or people from climbing over. Thus this release is as thrilling as it is exhausting. Across the entire program, there are homages and dedications to family and friends: composer András Mihály, composer Andræ Szervánsky, the music publisher Alfred Schlee of Universal Edition (the Aus der Ferne cycle), musician János Bali (Hommage à Jacob Obrecht), his own son György (Six moments musicaux), and violinist Walter Levin of the La Salle Quartet (Arioso). Content may in turn reference other composers and works. Squint sideways to spy something antique, the B-A-C-H motif, or a complete quote from Beethoven or Berg. Op. 1 was hard fought. Kurtág had arrived in Paris after the Hungarian Uprising. Psychologist Marianne Stein had suggested Kurtág write but a few notes at a time to overcome a creative impasse. The six movements are expectably concise, Webernian, and seething. Afterwards, the tendency towards watertight miniatures continues. The Molinari sculpt these intense bursts with acute confidence. By comparison, the Keller Quartet (ECM 1598 with Opp. 1 and 13, Aus der Ferne III and Officium Breve, etc.) activates a more glancing approach, perhaps confusing sunrise for sunset. 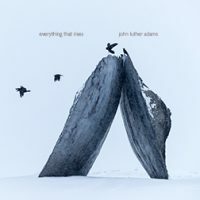 John Luther ADAMS: Everything That Rises (2017). JACK Quartet: Christopher Otto, Austin Wulliman (vln), John Pickford Richards (vla), Jay Campbell (vlc). Cold Blue Music CB0051 (1 CD) (http://www.coldbluemusic.com/). This quartet, 56:21 of just intonation, would have found friends among a previous installment. Adams’ structure is an immense upward spiral. Rendered without vibrato, the quartet orbits through gradually climbing variations or mutations on phrases and patterns never fully glimpsed. The motion is slow enough that one strains to determine whether there are canons, where the pattern may repeat or how many cycles it takes to get to the top range. Non-standard playing methods, col legno and precise scraping may suggest a struggling clock or a hovering machine. Apparently “16 harmonic clouds are traversed,” but the landings and windings are not obvious. The JACK achieves this as if it were one breath, a slow exhalation that might flicker candles or startle the sleeping.